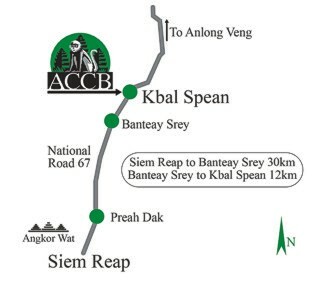 The ACCB is located at the historical site of Kbal Spean, 12 km north of Banteay Srey. The ACCB is only open to guided tours when accompanied by an official ACCB environmental tour guide, who has been trained to give up to date wildlife conservation information. The ACCB is a registered non profit organisation and all donations received by our guided centre tours go directly towards the feeding of our captive animals and aiding local communities. No profit goes towards administration or personal gain. Regular guided centre tour: Operates Monday to Saturday, starting at 9:00 and at 13:00 sharp, from the ACCB entrance gate next to the car park at Kbal Spean. The tour lasts approx. 1 hour 30 mins and requires a minimum donation of 3 USD. Please try to arrive in good time before 13:00, as late tours cannot be given due to logistical issues and stress for the animals. If you plan to visit with a group larger than 15 persons then you must contact the ACCB at least 48 hours in advance. During the tour you can see a variety of our animals and learn first hand about our efforts to save Cambodia’s wildlife. If you have a valid temple pass you can also take the opportunity to see the waterfall and riverbed carvings at Kbal Spean. Pre-arranged/ large group visits: For groups of 5 people or more, visits can be arranged outside the scheduled regular guided tour time. This must be organised at least 48 hours in advance (by telephone or email) and a minimum donation of 3.5 USD per person is required. Group discounts for 30+ persons can be arranged. School visits: Guided tours for schools, educational visits and special seminars or workshops can be arranged upon request. Such activities must be organised outside the scheduled regular tour time. Contribution fees can be discussed on a case by case basis. Photographers/ journalists: Our policy is to give guided centre tours by appointment with a member of the management team. Please contact us. Tel. : +855 (0) 99 60 40 17, send us a message by using the following form or via email to info@accb-cambodia.org.